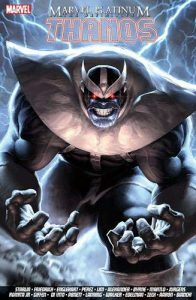 Thanks to wiping out most of the Avengers and a whole load of other folks on the big screen, Thanos is now the biggest, baddest villain in Superheroville. His infamy has spread beyond the confines of fandom and has become part of the mainstream consciousness and his name dwells and exists in all the quiet places populated by people who less than a decade ago couldn’t have cared less about caped crusaders and meglomanical tyrants. Thanos has, following his act of supreme logical barbarity that was writ large upon the imagination of millions, finally arrived. But unlike so many of his two dimensional contemporaries, the Mad Titan has a plan and a purpose that doesn’t just involve gratuitous carnage and the Universe bowing before him. He has vision and while he, like so many other would be despots, is more than a little fond of power and all the trappings that come with it, he was never motivated solely by a desire to reign supreme. His goal was always far more pure, as he was driven the thing that has been both the downfall and salvation of legions before him; love. Granted, it’s a love of death (or more accurately, it’s embodiment, Lady Death) which is more than a little twisted and insane, but as my old Gran used to say, it takes all sorts to make the world, or in Thanos’ case the Cosmos, go round. In short, he’s far from being your average monologueing baddie of the hour and is, all things considered, quite the complicated villain. And The Definitive Thanos attempt to get to grips with its subject by presenting a collection of his “greatest hits” which illustrate his highs and lows and paint him in a not entirely unsympathetic light.